Toys to keep mice and rats entertained. Small animals, especially Rabbits, love to flip, toss and chew toys made from corn, wood and sisal and such toys can encourage exercise. 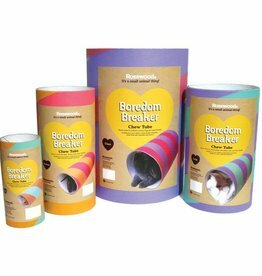 Rosewood Boredom Breaker Chew Tubes are made from pet-safe vegetable parchment tubes and are perfect for pets to shelter in or gnaw on. 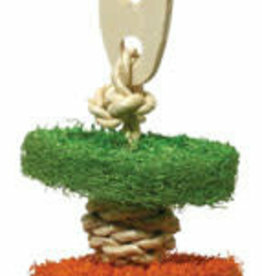 Natural loofa and corn leaf hanging toy. Fun for all small animals including rabbits, guinea pigs and hamsters. 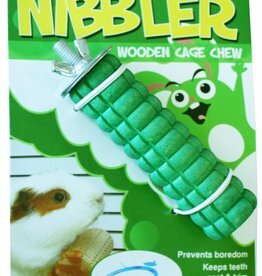 Fun for pets to play with and chew. 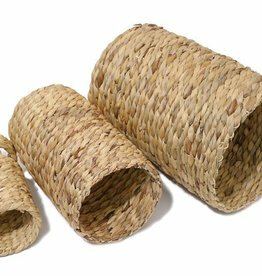 Rosewood Naturals Hay n Hide Tubes are perfect for play and 'gnawing' down those growing teeth. 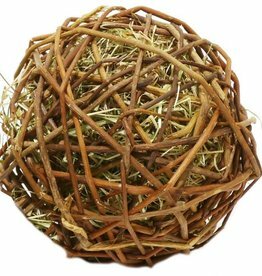 Rosewood Natural Edibles Weave-a-Ball is a large ball with layer upon layer of tasty chewable natural willow surrounding a centre full of premium hay with meadow flowers. 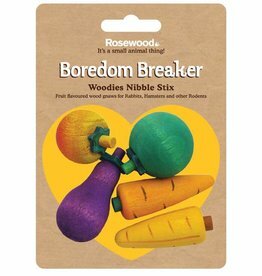 Rosewood Boredom Breaker 3D Nibble Sticks, is a collection of fun-shaped toys for your pet to gnaw on. 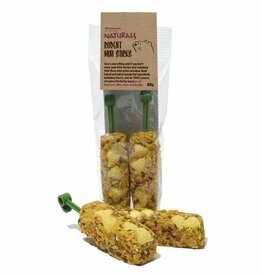 The Nibble Sticks are fruit flavoured to encourage your pet to play. 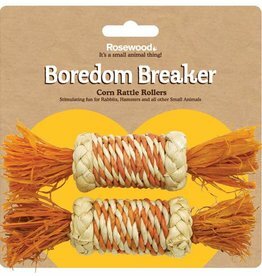 The Rosewood Boredom Breaker Flower Garland is a selection of Wood 'Gnaws', for your pet to 'chew' on. 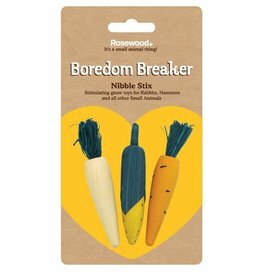 Rosewood Boredom Breaker 3 Pk Wooden 3d Veg Nibble Stix. 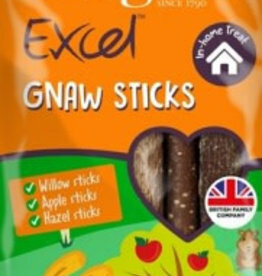 A pack of three 'Carrots' for your Pet to gnaw on. 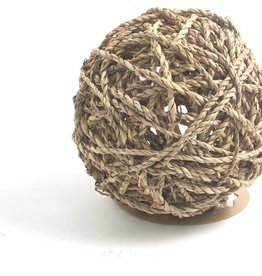 The Rosewood Boredom Breaker Sea Grass Fun Ball will give your small pet hours of fun playing with and chewing this ball. 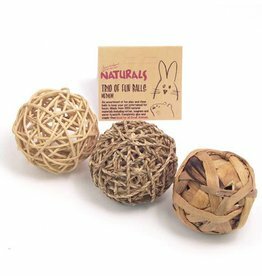 The Rosewood Boredom Breaker Trio of Fun Balls, contains three different types of 'chewable 'balls - one seagrass, one willow and one rattan. 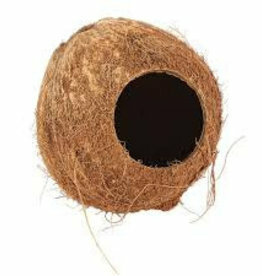 The Coconut Hut provides small pets with the perfect luxury snooze spot! 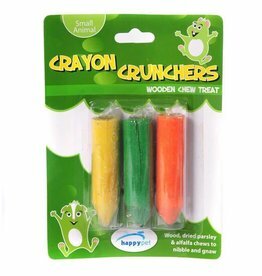 Crayon Crunchers are a natural and safe chew for your small animal. They help prevent boredom and also help your pet's teeth stay healthy and clean. 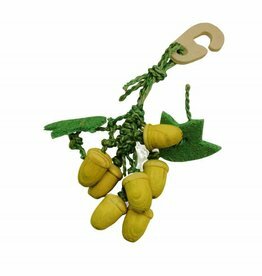 Critter's Choice Acorn Nibbler is a brightly coloured, yet safe, hanging berry shaped nibbling toy. 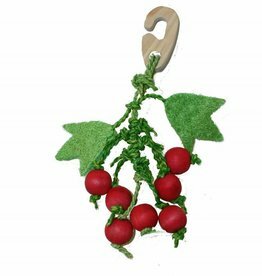 Critter's Choice Berry Nibbler is a brightly coloured, yet safe, hanging berry shaped nibbling toy. 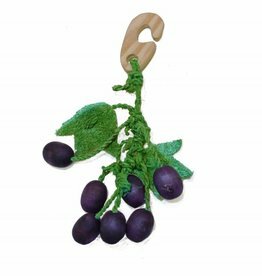 Critter's Choice Grape Nibbler is a brightly coloured, yet safe, hanging berry shaped nibbling toy. 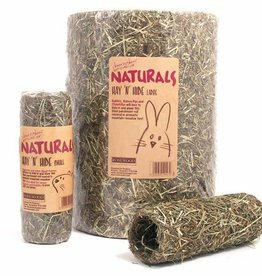 Suitable for guinea pigs, rabbits, chinchillas and other small animals. 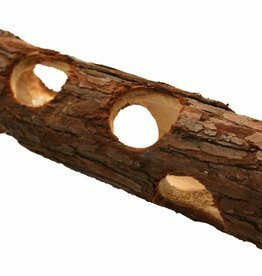 All natural cage fun, the fruit flavoured Nibbler Cage Chew is made from 100% natural wood. 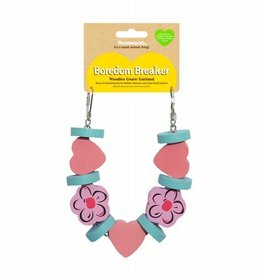 An excellent treat to encourage play, and to help to keep teeth healthy too! Attaches easily to any wire cage.